Whoa, I didn’t realize I’ve been on hiatus from posting. It’s due to a combo of things: Busy working, not in the mood, and I’ve got my mind on a life challenge. Anyhoo, while I work things out in this roller coaster called life =)), I’ve got some cartes du jour handy. Not really the newest for this edition since a couple of them have been around for years and years, but you still might find them helpful for future food trips. Alrightie, then. Let’s start this menu-centric post from the end of the alphabet chronology, a simple resto. 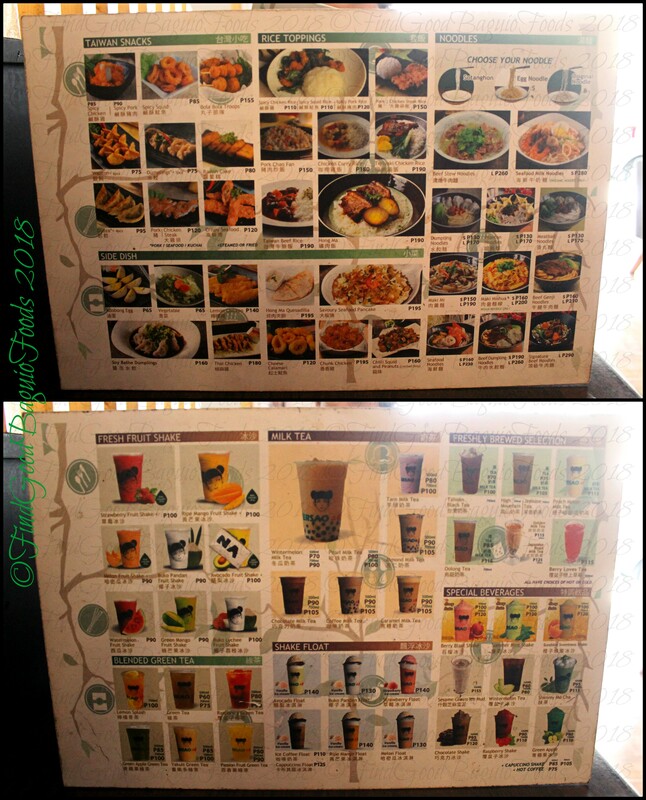 I’m thinking this is this generation’s Marosan’s … that raised the bar with their serving portions and unli rice. (“,) There’s more crispy skin lechon going on in their lechon plates, as well. And the best thing to me: A variety of vegetable in their mixed veggies. I was expecting tons of grilled, smoky, sauce glazed meats here but I guess they really meant a more gourmet-ish selection especially with the syllables of their ‘barbecue’ name jumbled around. =b There were liquor marinated meats (that weren’t available then) which I’m looking to come back for. One thing I’m sure about, however, is their sesame grains iced mud drink. A great cooler for these sun shiny summer days, methinks. Taiwanese food looks delicious. Where is Ersao Taiwanese Restaurant? 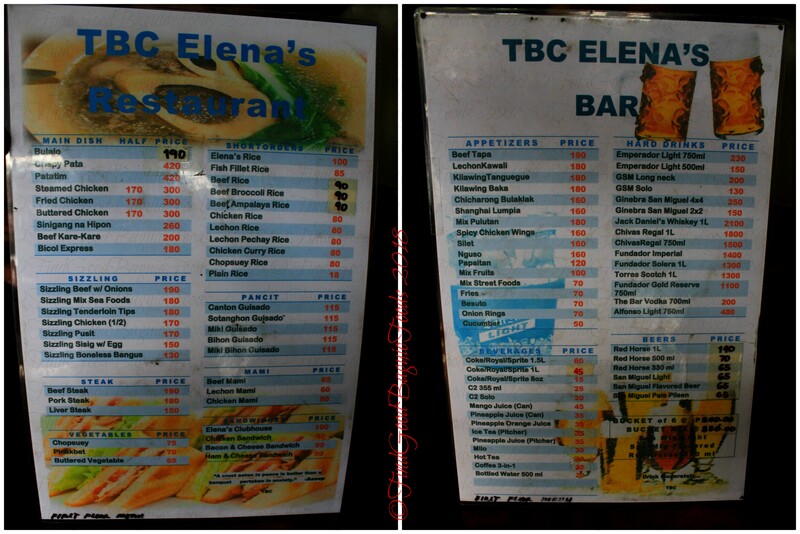 Elenas is a very old establishment and I remember DJ Naughty Nicky on HB radio. Where is his restaurant? 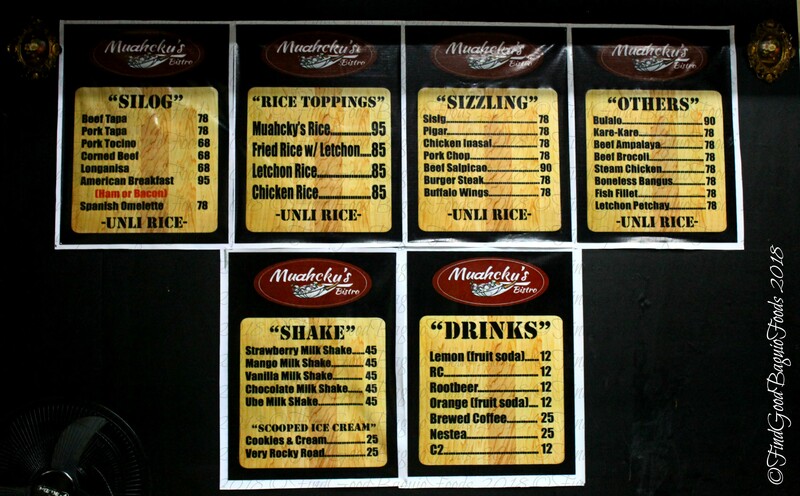 and Muahcky’s Bistro? No harm done. Thank you for the addresses. Hiyee, Mario! Yes, same lemons, I did say, it was a bushel. Shyeew. Cinco Antonio Bistro and their majorly refreshing agua fresca is located in Mines View, I think that’s two buildings before the Ibay Zion Building, when you’re coming from Outlook. 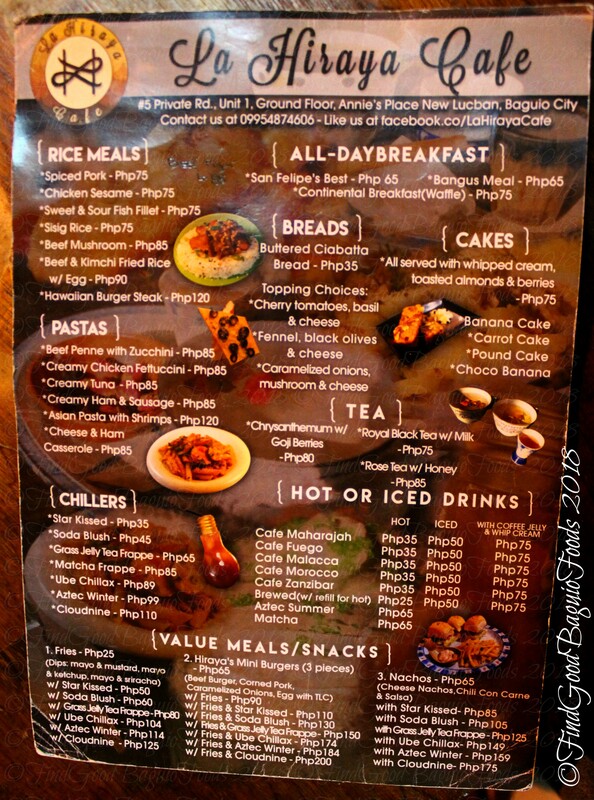 La Hiraya Cafe address is #5 Private Road, Ground Floor Annie’s Place, New Lucban, almost across from STI. Can i have the address of Ersao? Thank you. Ayyy bulag akez. 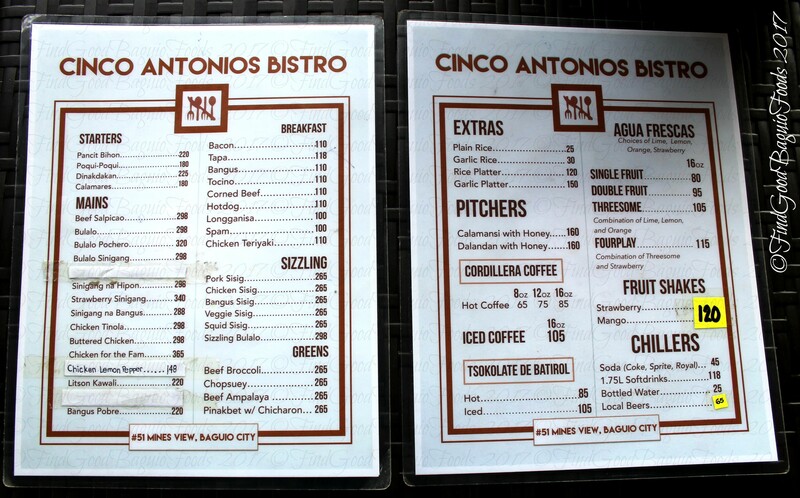 May address na pala dun sa menu sa Cinco at Hiraya. 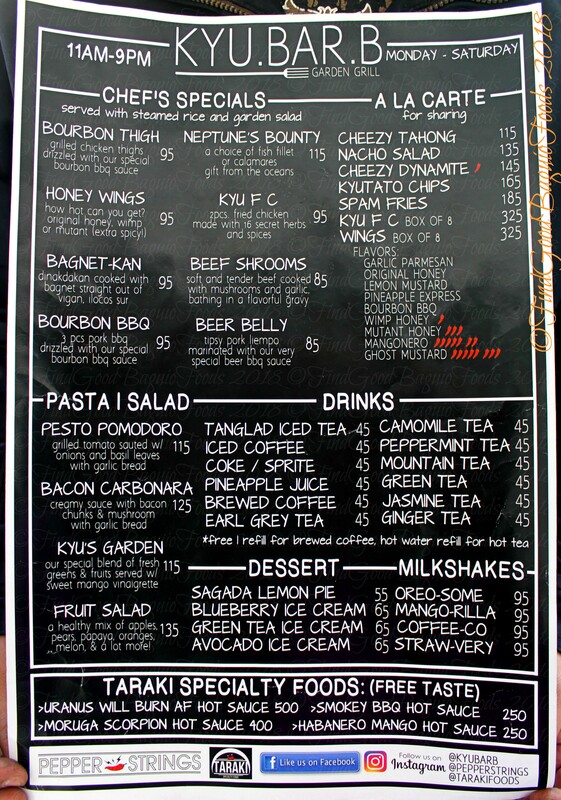 hello, san po ang location ng Kyu.Bar.B Garden Grill? thanks! Hello, rustynail! KyuBarB Grill is located on Caguioa Street. A few steps from the building that houses St. Joseph drug store.